Handcrafted by Swiss cheesemakers Marcel Züger and Markus Hengartner at dairies in the villages of Rohrenmoos and Illighausen, Rahmtaler Reserve is truly a special cheese. 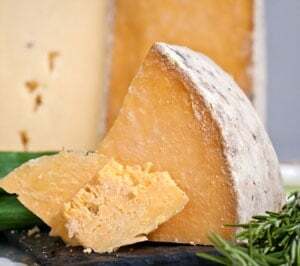 The style dates back to the 16th century when, due to a surplus of butter in the Emmental region, butter production was curtailed such that the milk used for producing Emmentaler cheese was no longer skimmed. And when Emmentaler was made with full-cream milk, it produced a particularly creamy paste and, thus, Rahmtaler was born. The word 'rahm' means 'cream' in German. Many cheeses are made with skim milk, so when cream is added back into the vat, as with Rahmtaler, it really adds a lot of richness to the paste. You really can taste the difference. 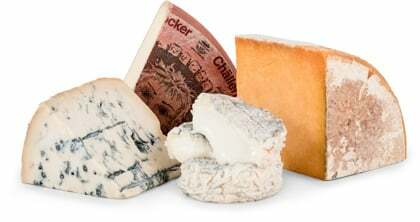 The Rare Cheese Club offers a handful of double and triple crème cheeses in our featured selections, but they are all small, bloomy-rind, fresh cheeses. Rahmtaler Reserve is a different animal—a large format (200-lb wheels! ), 12-15 month cave-aged cheese with cream added. It’s pretty rare stuff as there are only two dairies in the entire world making this traditional recipe for Rahmtaler, and affineur Gourmino selects the best wheels for aging. The rind has a lovely ring of mountain flowers around the top. Cut the wheel open and you'll see large 'eyes' evenly dispersed on the face of the cheese. But, that's where the similarity to Emmentaler ends. At three months of age, Rahmtaler is considered a semi-soft cheese because of its creaminess, but after a year of maturation, Rahmtaler Reserve is considerably firmer while maintaining its creamy texture on the palate along with fuller flavors. A traditional mild, nutty, slightly grassy, alpine mountain meadow flavor often associated with mountain cheeses is the underlying flavor throughout this cheese, but it’s got a little something else going on here too. There’s a fun sweet and sour balance in the finish that makes it a bit more complex and very pleasing. Rahmtaler Reserve will pair nicely with a Farmhouse Sour Ale such as Logsdon’s Rakau Boy, a Hoppy Strong Witbier spiked with wild Brettanomyces yeast and featured in The Rare Beer Club.